Nearly two dozen Mississippi State faculty, staff and students were honored recently with major awards in the College of Agriculture and Life Sciences and Mississippi Agricultural and Forestry Experiment Station. At the campus ceremony recognizing teaching, research and service achievements, George Hopper praised the honorees for their dedication to the university's land-grant mission. Hopper is both dean of the college and MAFES director. "Our scientists are engaged in impactful research on a global scale and right here at home in Mississippi," Hopper said. "As our faculty trains the next generation of agricultural leaders that will feed and clothe the world of tomorrow, our service-leaders lend a hand to help producers improve efficiencies and outcomes today." —Assistant Professor LaShan Simpson, Department of Agricultural and Biological Engineering, CALS Teacher of the Year and Excellence in Teaching Award, Upper Division. Simpson advises graduate students, undergraduate researchers and high school students conducting research in her lab. She regularly seeks funds for student support, including a grant from the Center for the Advancement of Service Learning. She helped charter the BEAM student chapter on campus, an undergraduate chapter component of the Biomedical Engineering Society, and has mentored two NSF Graduate Fellowship recipients. —Associate Professor Joel O. Paz, Department of Agricultural and Biological Engineering, Excellence in Teaching Award, Lower Division. Paz serves as the agricultural engineering technology and business undergraduate coordinator, advising 37 undergraduate students including a number of transfer students. Paz is credited with employing real-world examples and helping prepare students for the jobs they will have upon graduation. —Assistant Professor Lori Elmore-Staton, School of Human Sciences, CALS Excellence in Teaching Award, Graduate Level. Elmore-Staton has taught more than a dozen different courses, developed three new courses and updated two courses since she joined the university in 2012. She advises about 27 undergraduate students and six graduate students each year. —Assistant Professor Te Ming Paul Tseng, Department of Plant and Soil Sciences, New Faculty Award. Tseng began teaching at MSU following a post-doctoral associate position at Purdue University. His peers and students point out his use of virtual reality as a tool for understanding specific organelle functions inside a plant cell. In addition to teaching, he also supervises one research associate and five undergraduate research interns and has hosted three international visiting scholars. 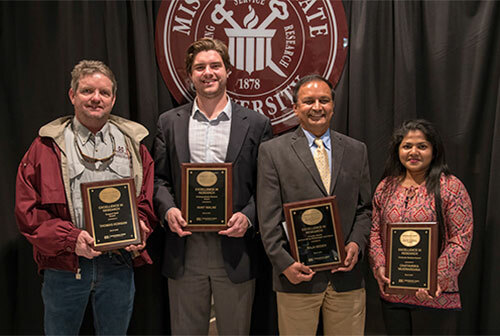 —Raja Reddy, MAFES research professor in the Department of Plant and Soil Sciences, Mississippi Land Bank-sponsored MAFES Excellence in Research Faculty Award. Reddy, who has been with the university 29 years, has published 138 refereed publications. His other publications and abstracts exceed 400. As director of the Soil Plant Atmosphere Research unit, Reddy has conducted more than 125 research projects, served as major professor for eight doctoral students, eight master's students, and two undergraduate research scholars. Additionally, he has hosted 17 visiting scientists and 35 postdoctoral scientists. —Sead Sabanadzovic, MAFES researcher and plant pathology professor in the Department of Biochemistry, Molecular Biology, Entomology and Plant Pathology, the MAFES Outstanding Publication Award. Sabanadzovic collaborated on a study that was published in the Journal Nature Reviews Microbiology titled "Virus Taxonomy in the Age of Metagenomics," which presented a conceptual revolution and paradigm shift in how viruses will be classified in the future given modern molecular methods. Sabanadzovic also is appointed to the international body responsible for virus taxonomy. —Eric Stafne, associate extension/research professor in the Department of Plant and Soil Sciences and stationed at the Coastal Research and Extension Center in Biloxi, the MAFES Most Impactful Publication Award. Stafne was part of a team that published the first peer-reviewed publication addressing drupelet disorders in blackberries. The article titled "White Drupelet Disorder on Three Blackberry Cultivars in South Mississippi" was published in HortTechnology. The scientists investigated environmental effects like temperature and rainfall and found best management practices can be employed by growers to minimize the issue. —Chathurika Wijewardana, doctoral student in the Department of Plant and Soil Sciences, the MAFES Excellence in Research Award, Graduate Category. Wijewardana has authored or coauthored 10 refereed publications, including a study on cold-tolerant corn hybrids that was published in Crop Science and featured in CSA News Magazine. She won the Outstanding Graduate Manuscript Award at the Mississippi Academy of Sciences. Raja Reddy is her major professor. —Senior agronomy major Hunt Walne of Collierville, Tennessee, the MAFES Excellence in Research Award, Undergraduate Category. Walne has studied drought tolerance in corn under the direction of Reddy. He is a Golden Opportunity Scholarship recipient and spent two years as student senator for the College of Agriculture and Life Sciences. His poster and oral presentations have garnered statewide and regional awards. —Research Associate Thomas Horgan, MAFES Outstanding Research Staff Award stationed at the North Mississippi Research and Extension Center in Verona. Horgan works with scientists in vegetable research trials, including organic varieties, and numerous horticulture research projects. —Richard Harkess, plant and soil sciences professor, CALS/MAFES Outstanding Faculty Service Award. Harkess chairs several committees including three for the university, seven for the college, 10 for the department, four for the community, and many for the professional societies where he is a member. In the community, he serves on the Keep Starkville Beautiful Committee and the Starkville Tree Advisory Board, and is part of the Oktibbeha County Master Gardeners, among others. He also is internship director for the MSU SUCCESS Program. —Terezie Mosby, food science, nutrition and health promotion assistant professor and dietetic internship director, CALS/MAFES Diversity Faculty Award. As the dietetic internship director, Mosby has expanded efforts to recruit greater diversity in the dietetic internship program and established a broader array of dietetic internship rotations, including the addition of the Choctaw Indian Reservation. —Christien Russell, agricultural science doctoral student, CALS/MAFES Diversity Student Award. A current doctoral student studying agricultural science and extension education in the School of Human Sciences, Russell has been instrumental as a mentor in the MSU Chapter of MANRRS—Minorities in Agriculture, Natural Resources and Related Sciences, serving both as MSU chapter parliamentarian and as the National MANRRS Region III graduate vice president for 2017-2018. Her doctoral research is focused on cultural competency with the lens of understanding the experiences of minority and majority populations on campus as it pertains to culturally responsive teaching. —Carrie Vance, assistant research professor in biochemistry, molecular biology, entomology and plant pathology, MAFES Grantsmanship Award, which recognizes the scientist who garners the most in extramural grant funds. —James "Jay" McClelland, assistant dairy plant manager for the MAFES Custer Dairy Processing Plant, CALS/MAFES Outstanding Professional Staff Award. —Ericka Bazzill, administrative assistant to the Division of Forestry, Agriculture and Veterinary Medicine associate vice president, CALS/MAFES Outstanding Support Staff Award. The ceremony also recognized MAFES personnel for leadership in promoting outstanding grounds maintenance and overall image achievements at the 16 MAFES branch experiment stations throughout the state.